Jake Heilbrunn ending up living in a spiritual community on an island in Nicaragua where he was exposed to mindfulness and meditation. Ask yourself: What’s the best thing that could happen? Exactly two years ago, something happened I will never forget for the rest of my life. I was 18 years old and waiting to board a one-way flight to Guatemala. I had just a backpack. I had never traveled alone before. Other than “hola” and “gracias,” I spoke no Spanish. And I had no cell phone. I’m sitting in the airport, surrounded by all these Guatemalans, and I’m wondering where all of them are headed I felt this sense of anxious excitement but also this sense of calm, despite the unknown. Sitting there, I thought to myself, “How did I end up in this position?” It brought me back eight months prior when I had a much different experience with anxiety — an experience that led me on the path that would change my life. I started to develop severe anxiety. Up until this point, anxiety was just a word to me. It now became this dense ball that would roll up my chest and constrict my throat, making it difficult to speak, like this hyper-tension, and I had no idea why. I remember feeling so alone. I felt like I was the only one going through this. Other than my parents, who were concerned, almost nobody knew that I was struggling with anxiety and depression. At the time, I didn’t know that 1 in 4 teenagers experiences some sort of an anxiety disorder. At the time, I didn’t know that anxiety is the most common mental health diagnosis on a college campus. With everything I was going through, I started to question “the why” in everything. Why am I in school? Why is this happening to me? What is the purpose of life? I felt really conflicted investing myself physically, mentally, emotionally and financially down a path that I had never even really questioned. I was just living the script that society had for me. There was this 21-year-old girl who was killed in a car accident off campus. I remember thinking to myself, what if that was me? Would I go out knowing that I was living a life true to myself? I’ve always been fascinated by other cultures, and I started playing with this idea to take a semester off and travel. I would lay in bed at night, and I would just imagine myself trekking in these foreign lands and meeting people from all over the world. I’d get so excited. I could feel the adrenaline coursing through my veins and my heart pounding in my chest. Of course, I’m just lying in bed, looking at the ceiling. But this other voice of fear would settle in and say: “Jake, no one else is doing that. You have to stay in school and stick to the path that’s been set out for you.” For months and months, I battled back and forth with this anxiety. Do I just continue to stay in school and do what everyone expects me to do? Or do I listen to this true inner voice and travel? It was the first night back for the second semester, and Ohio State was in the National Championship football game. We won, people went crazy, thousands of students swarming through campus, lighting bonfires, shooting fireworks. A crazy celebration. What do you do in a moment like that? You whip out your phone, you take a picture and you post it to Instagram. And that’s what I did. Waking up the next morning, I grabbed my phone, and I had all these likes and messages from people saying things like: “Congrats on the game, Jake. You must be so happy.” “Oh, you’re killing it man. You’re living it up.” Reading each one of these messages, I felt my stomach twist. I hated the fact that I was portraying my life as happy and perfect when, in reality, I was struggling. I was anxious, I was depressed, and I wanted to share that side of me. Lying in bed that morning, I felt stuck and didn’t know what to do. I decided to call a career counselor who I had seen a couple of times the first semester. She knew what was going on in my life. That day, she asked me two questions. 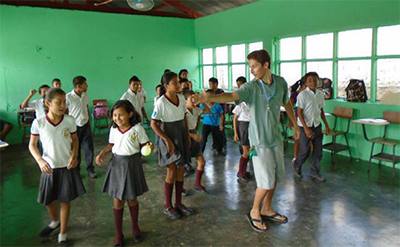 Heilbrunn spent time in a rural town in Guatemala where he volunteered and taught English. First, she said, “If you do take leave from school and travel, what is the worst thing that could happen?” I started to think about it, and my mind went to the most awful places. I thought, if I did this, I would become this huge failure. I’d probably be on the streets for the rest of my life. I would never amount to anything. When I said my fears out loud to her, I realized that’s all they were. Just fears. “Now boarding Flight 5864 to Guatemala City.” The loud speaker grabbed my attention. I jumped up and put on my backpack, and I started walking toward the gate. I was feeling excited but nervous. After getting to Guatemala City, I had to get on this nine-hour bus through this rural town where I was going to volunteer and teach English. But the homes there had no addresses. There’s almost no Wi-Fi. I didn’t have a phone. I didn’t know how it was all going to work out. My second week in Guatemala, there was this big party being held for Semana Santa, which is one of the holiest holidays in Guatemala. The whole town gathered, and they were blasting Spanish much, Enrique Iglesias, and people were dancing like there was no tomorrow. Despite my awful dance moves, I was moving and grooving and having the time of my life. That night, lying in bed, I couldn’t sleep. But I realized that this was the first time in as long as I could remember that it wasn’t because of anxiety. It was because my reality was better than my dreams. Now I knew what it felt like to be living with passion instead of anxiety. A couple weeks later, I was sitting at dinner with my Guatemalan family and some other volunteers, and I suddenly realized I had absolutely no idea what day or what time it was. Living in this town with small homes and basic electricity, people lived simply but happily. And it was contagious. I decided not to bring my phone on my travels because I was constantly comparing myself to other people, feeling like I always had to share everything and be checked in. Social media and I — we were kind of in an abusive relationship, and we needed to take a break. Living in this town without my phone, my focus was on the world in front of me and the relationships I was building. I wasn’t distracted by anything else. Instead of receiving Instagram hits and dopamine hits from Facebook likes and checking my phone 70 times a day, I was fueled by this lasting energy, this fulfillment from the connections I was making face to face. A couple months later, I found myself living in this spiritual community on an island in Nicaragua. It was here I was exposed to mindfulness and meditation. At first, I thought the whole mindfulness meditation thing was weird. I imagined monks in orange robes sitting in the Himalayas, humming. It seemed weird to me. On top of mindfulness and meditation, there was breath techniques and eating breakfast in silence. Every morning, 15 of us, just eating our food slowly. Nobody talking. But after a couple of days of experiencing these new things with an open mind, I began to feel a sense of peace and calm and presence and connection that I didn’t even know was possible. It brought me back to being 8 years old and seeing people do tai chi at my local park. I thought they looked kind of funny. But now I got it! Tai chi was a vehicle for these people to be more peaceful and present and calm and connected. 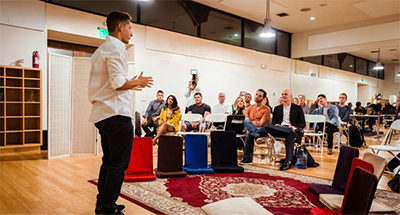 Meditation and mindfulness and eating breakfast in silence — these were vehicles allowing me to be more peaceful and present and calm and connected. Sitting on the airplane coming home after four months of traveling abroad, I began to see how all the dots in my past were starting to connect. Being at school with severe anxiety and the skin condition was almost like my inner GPS was telling me that something was off, that I kind of had to reroute. This led me to start questioning everything. I got in touch with this calling, this inner voice telling me to travel. When I finally mustered the courage to answer that call and take that leap of faith, everything changed. Living in this town in Guatemala without my phone and experiencing this different way of life. 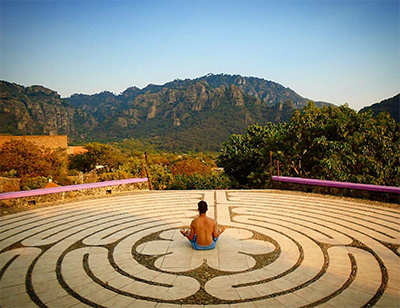 Going down a mindful path and learning about mindfulness and meditation in Nicaragua. 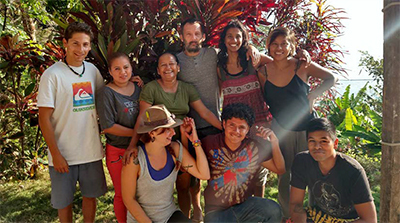 Heilbrunn wrote about his soul-searching journey through Central America in his book Off the Beaten Trail. Heilbrunn speaks about his experiences at high schools and colleges around California. 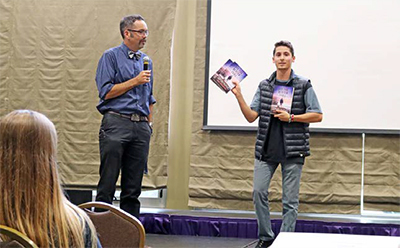 Being home and speaking at high schools and colleges around California, it is shocking to see that what I thought had been unique to me — this severe anxiety and depression — is something that millions of young people are experiencing around the country right now. This is insane. This is insane that 5,000 young people take their lives each year, a rate that has tripled since the 1960s. This is insane. This is insane that anxiety and depression rates among high school and college students have shot up five to eight times more than just 50 years ago. Why are depression and anxiety rates skyrocketing among youth today? I get so fired up about this because I remember being there, in my dorm stairwell, in tears and just so angry and upset and confused. I get so fired up about this because I remember feeling trapped and scared of that unknown path. I get so fired up about this because I know if I could shift from anxiety and depression to peace and purpose, then the millions of other young people around this country can as well. We all can. That’s why I wrote my book, Off the Beaten Trail. The solution, though, isn’t dropping everything and hopping on a flight to Guatemala. That was part of my story and what my inner voice was telling me to do. There are millions of students and kids around this country, yet we’re funneling them down just one path. That traditional education system may work for some kids. That’s great. But it doesn’t work for all. Because what fascinates Chandler, might bore Peter, and what lights up Nicki, might have no interest to Bella. And that’s OK. This disconnect is due to a misalignment with how we are living. This disconnect, which I remember feeling so vividly, is causing anxiety and much worse. We feel this intense pressure to be something that we’re not. We’re immersed in this culture where we’re forced to memorize information and dump it on a test, where our value is defined by letter grades and numbers. We feel this intense pressure to be a 5.0 student who is the president of four clubs, has cured cancer and has 100,000 Instagram followers. What if we pursue what we were truly curious about? What would that look like? What would that feel like? When we have the audacity to pursue what we truly want — not what Mom or Dad or cousin Eric or Steve wants — but what we truly desire, passion replaces anxiety. Passion replaces anxiety. So, what can we do? What can we do as students? And as parents? And adults? And educators? Be conscious of how you’re using social media. Social media can be a great tool to connect us and help us solve problems and create solutions and bring us together. But it can also do the opposite. It can isolate us make us feel alone and unhappy. At the end of the day, social media is a tool, and we must be conscious of how we’re using the tool and not letting the tool use us. Embrace mindfulness. Embrace calm and peace and presence and connection. Last but not least, have courage. Courage to listen to your inner voice. Courage to follow it, even if it leads you in an unknown direction. My favorite quote is by Steve Jobs. He said: “You cannot connect the dots looking forward. You can only connect them looking backwards.” You have to trust that the dots will somehow connect in your future. And they do. What do you truly desire? Close your eyes. I invite you. What is that thing or that dream that calls out to you? What makes you come alive? What lights you up? How does that feel in your heart? In your legs? In your stomach? In your arms? In your chest? If you listen to this inner voice, what is the worst thing that could happen? If you listen to this inner voice and follow it, what is the best thing that could happen?